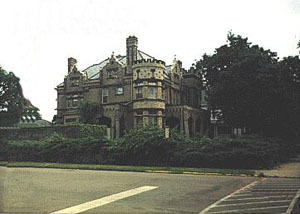 Now known as Castle Inn, this building was the first mansion residence of the Samuel T. Ruggles family. It was built in the late 1800's and was inspired by several European castles. It has many stained glass windows, including a beautiful piece at the end of the stairway. One of the rooms in the tower has a bathroom paneled in rose marble, ornate walnut and has marble furnishings. The castle is now run as a Bed and Breakfast. Castle Inn in Circleville - This is a really sad story. I know the man whose grandfather built the castle; the gentleman's mother was raised in the castle as was he. When he was divorced by his wife, she forced a sale of the property. The poor man moved up to Columbus into a very small ranch house, filled with all of the large scale furniture he could squeeze into it. He missed the residence very much and is still saddened by its sale.